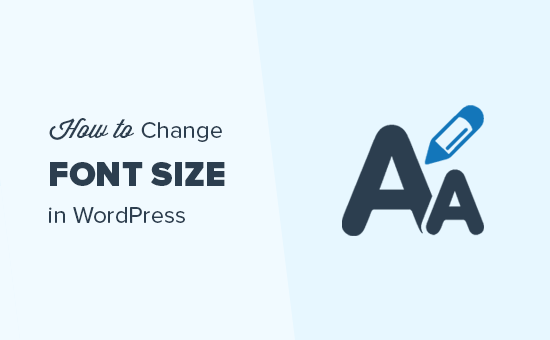 Do you want to change the font size in WordPress posts and pages? There are a few ways to increase or decrease font size and text formatting in WordPress. 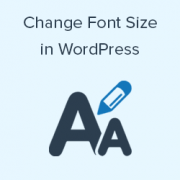 In this article, we will show you how to easily change the font size in WordPress. These sizes are controlled by your theme’s stylesheet file (style.css) to make sure that the font size is coherent with everything. In most cases, one of the heading sizes should get the job done. Using headings in your articles is good for user experience at the same time it also makes your WordPress posts SEO friendly. For this method, we will use a WordPress plugin to get a better control on overall font-sizes and text formatting when writing content. First thing you need to do is install and activate the TinyMCE advanced plugin. For more details, see our step by step guide on how to install a WordPress plugin. Upon activation, simply go to Settings » TinyMCE Advanced to configure the editor settings. On this page you will see the TinyMCE Editor tool bar with buttons. You will also see unused buttons below. Now all you need to do is drag and drop the font size button from the unused buttons to any row in the toolbar. After that click on Save Changes button. 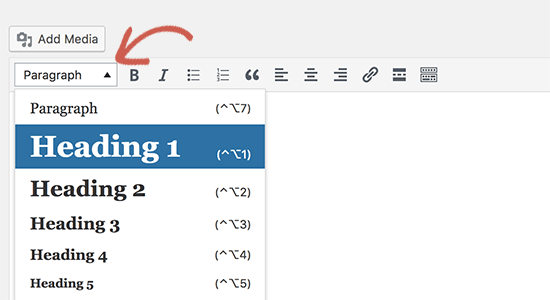 To see the button in action, create a new post or edit an existing one and you will see the default WordPress visual editor is replaced by the TinyMCE Advanced editor with font-size button. As you can see in the screenshot above, that you can select any font size you like from the drop down. This gives you more freedom over things because now you can actually have font-size even smaller than the normal body font i.e 8pt or 10pt. The biggest downside of this method is if you ever change themes, you have to account for all the font size changes you made in individual posts. If you are unhappy with the font size your theme uses for paragraphs and want to change it, then the best way to do this by using CSS. You will need to add the following custom CSS to your WordPress theme. Note: This change will affect all paragraphs in your WordPress theme and you will loose your changes when switching themes. 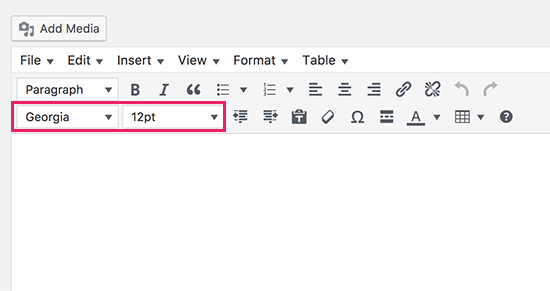 We hope this article helped you learn how to easily change font size in WordPress. You may also want to see our list of the best typography plugins for WordPress to improve your site’s design and readability. My theme is Sydney The articles’ titles are too big in mobile. Is there a way to change them without coding and without plugins. I use Elementor. If you’re using Elementor, then it should have options to change the font size in the design options for what you’re using to display the post. If you’re not customizing your layout with Elementor it would require CSS or reaching out to the theme’s support. I want to change the site title font on my self-hosted wordpress site and cannot get a simple answer as to how to do that. can you help? In the video, at 28 seconds, the editor is shown. There are all kinds of tools in the button bar. My dashboard doesn’t have that editor. There are, in fact, no buttons at all, just a text box with giant text in it. So, how do I get access to a real editor like you have? I want to make text h1 but the text size should be as paragraph. Is this possible? Yes it is possible if you are using TinyMCE advanced plugin you can select a heading and change its font size. What if you want to make the title smaller but the tagline bigger? Being able to dictate fonts and sizes of text in posts is great, but how about the title and tagline? Love these tutorials. This tutorial helped my font look uniform on my website. Thanks again! I installed this and it doesn’t show in the editor? What am I missing? Thanks. My old WP theme appears to have coded Heading 1 in 12 pt font like normal text. I manually change each heading to 14 pt. But then the coding doesn’t say “h1” which Google robots look for. If I use your plugin(which is cool) and change heading font sizes, will they still be labeled h1, h2, h3? Also, I don’t want to change fonts on pages already customized. Can I apply the plugin to blog posts only? Thanks. You can give plugin a try. However, if your headings are hard coded in the theme then this may not help you change those headings. The use of px (or pt) in this Guide is not recommendable, because on small Screens like on Smartphones the font size is very small. Its better to use em. How do I change the font size of menu items? hi, my fontsize is % not pt, how can i change it back to pt? I want to enlarge Excel spreadsheets in my posts. I snip them and upload them via Add Media. But I don’t see a way to increase the font size of these uploads. So…. I increased the font size in my spreadsheet and then snipped and uploaded the spreadsheet with the larger font – but it still appears as the original size. Is there any way to increase the font size in the post as it currently is too small to be easily read (there are several columns in my spreadsheet)? We are not sure we fully understand your question. If you are uploading your spreadsheet as an image file, then its dimensions will depend on your post container. Let’s suppose your post container or content area is 600px wide, then your theme will automatically shrink the image to fit in the container. You can also try selecting full size image before inserting it into your post. Hi, thanks for sharing, very useful indeed. Is there a way to also adjust the font size of the title, or maybe better done in CSS (and if so, how)? thanks again! I use tinymcv plugin to change the font size. but when i press enter and go to the next line the font size will be default value which is 9pt. How can I change the default value to 12pt. Thanks for the post. But I want to know more… I want to make the bigger size of some special word in a sentence without any plugin. Special words in a sentence. e.g. we are doing in MS word. Can it possible? Hope your answer. Hi jitendra to do that open your text editor. You can change the font % by any value. I hope it will help you. Thanks for the video and info, but I can’t change single lines of font sizes when writing a blog post. In Visual Editor when I select “Heading 1” or “Heading 2” it changes the entire entry, but I only need to change that one line. I have to double space to make that happen without changing everything else. But then the spacing is wrong because it doesn’t need to be double spaced. Please help. And is there any other way to change font by font size (11, 12, 14, etc) instead of the preselected “Heading 1” “Heading 2”, etc.? Because TinyMCE didn’t work for me. Thanks! Not kidding. This should not be this difficult. Every time I hit return it reverts back to the original size. Do I really have to select the font size for every single paragraph? Hi. Thank you. I am learning how to edit font size, font type and spacing. This is a big help. Hi, first of all thank you for all the knowlege available on this site. It’s great ! I followed instructions from this article, but I still can’t change to font size in headers. I installed both TinyMCE and Google fonts. I am able to change font styles but not the size. Thanks for this great post. It worked for me. I can now edit font family, change font size, underline text, highlight text and even insert table. Thanks. I just updated my site and theme. I am having a weird issue of my woocommerce product titles having bigger fonts than they were before updates. i have tried custom css from other forums and wondering if maybe I can get an option here.. Kindly advise. Have you tested your website with different browsers and devices to make sure that it is not an issue with your browser settings. After that try reaching out to your theme developer, they will be able to tell you whats changed in the new version or if there is a better way to solve this issue. Is there a simple way to set a new default font size in WP? I have been manually setting to a larger font to improve readability but the theme doesn’t like it and tends to revert back to default whenever I press ENTER and also the paragraph headings don’t work when I’m inside text with the new size. I’d have thought this would have been one of the first features to include in WP themes. The current default font is very small and I find it hard to read. You can go to Appearance » Customize and click on the Additional CSS tab. Then in the CSS box on the left panel, add this CSS at the end of whatever text/code you see there. You will see font size change in the live preview. Don’t forget to click on the ‘Save & Publish’ button on top. This is so ridiculous and why I’m having a hard time with WP. It should be just as Word. You highlight the text and select from 100’s of fonts. Why does WP make this so difficult for the lay person? Can this not be changed? How do you change the font size of the title….I am not talking about content I mean the page title located at the very top of a page.. Please ask your theme developer for support. Most probably the fonts used by your themes don’t have good support for the language. I am trying to change the font size in my menu above my pages, how do I do that?